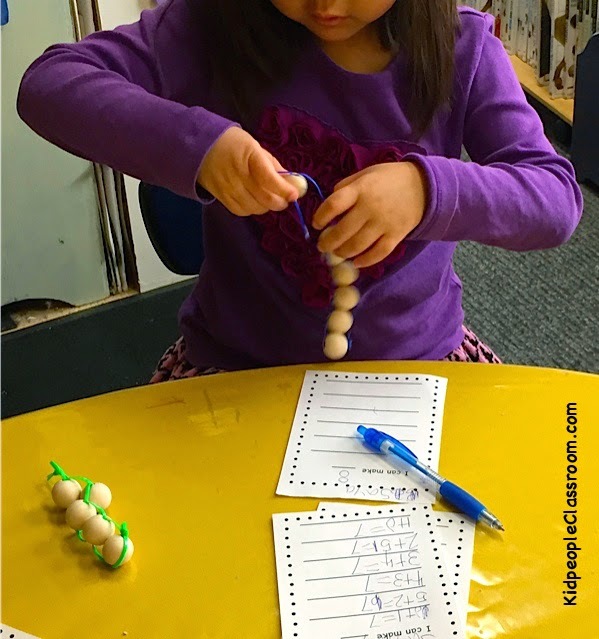 Kidpeople Classroom: Bead Sliders for Math and a Freebie! Bead Sliders for Math and a Freebie! Whoot! It's Monday Made It. 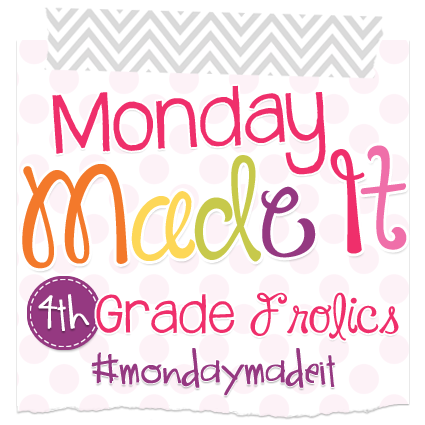 Thanks so much Fourth Grade Frolics for this month's linky. My kids love these! We call them bead sliders. They are great to use in math to provide concrete practice of counting, number combinations, and composing/decomposing. 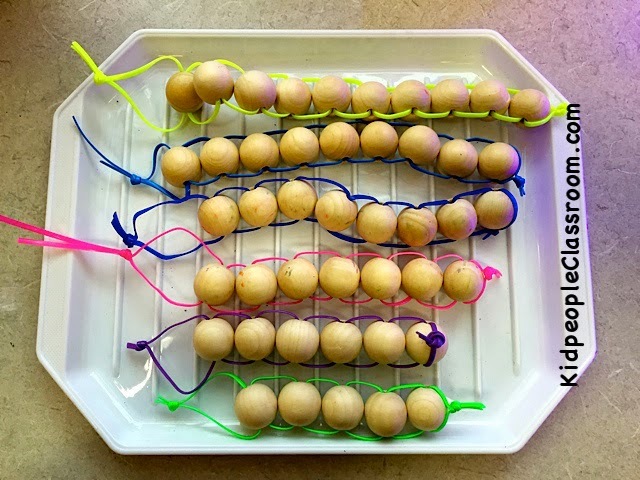 You slide the beads over to separate them into two groups, like you do on a rekenrek. However, these bead sliders have an added bonus– they feel really great to manipulate. When you pull the bead to slide it along, it gives not-too-hard, not-too-loose pressure for smooth movement. Here's how you make them. You'll need plastic gimp stringing lace– the flat kind. 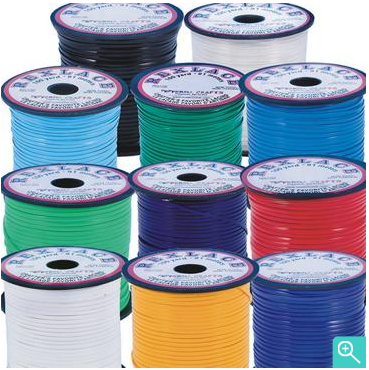 It comes on spools of 100 yards for about $3... you'll be able to supply your whole school with gimp :) You can find it in craft stores like JoAnn's or Michael's, and it comes in many colors. Click on photo below to see. I use a different color lace for each bead slider of a particular number to make it easy to grab the slider I want. However, to save money, you can buy just one roll of one color. You'll also need wooden beads of about an inch diameter with a small hole. Take two pieces of lace. The exact length depends on the size beads you use and the number of beads you want to put on. Use two long strands to start with and adjust as you do more. Knot the lace securely. I keep the lace smooth when knotting and use needle nose pliers to pull it tight. I haven't had any trouble with them coming undone. This is the knot I use. Then string one lace through the bead in one direction and the other lace through the hole in the other direction. Pull the laces through so they are even and the bead is square to the knot. Then string the two laces through the next bead, in opposite directions again. It is important that you keep the lace flat and not twisted when you string the beads. The beads won't slide as well if you don't. It's not difficult, just something to be aware of. Put on as many beads as you want that slider to have. Then to end the slider leave about the length of a bead before knotting it off. 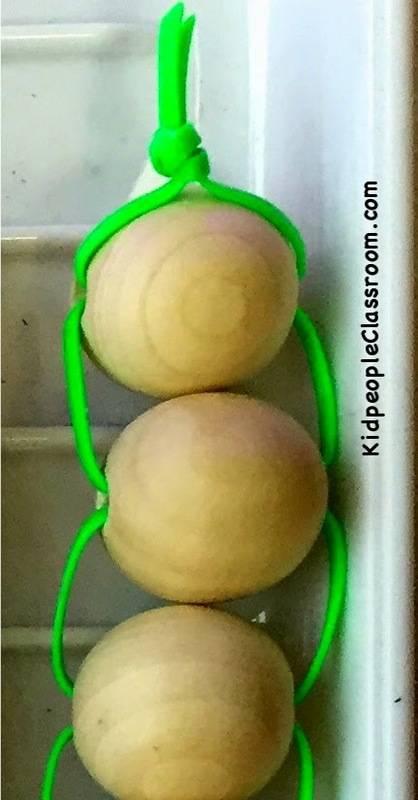 You want there to be room to make a gap between beads so kids see two groups as they slide beads over. Knot securely again, and cut it off. 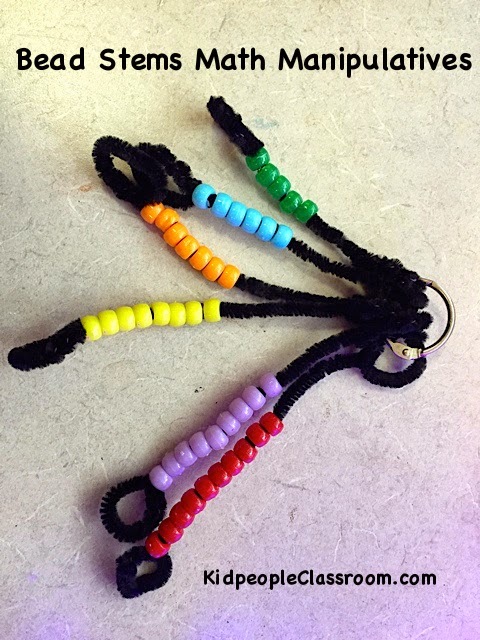 Students slide the beads over as they count/compose/decompose the same way they do on any rekenrek or counting stick. Now for the Freebie! 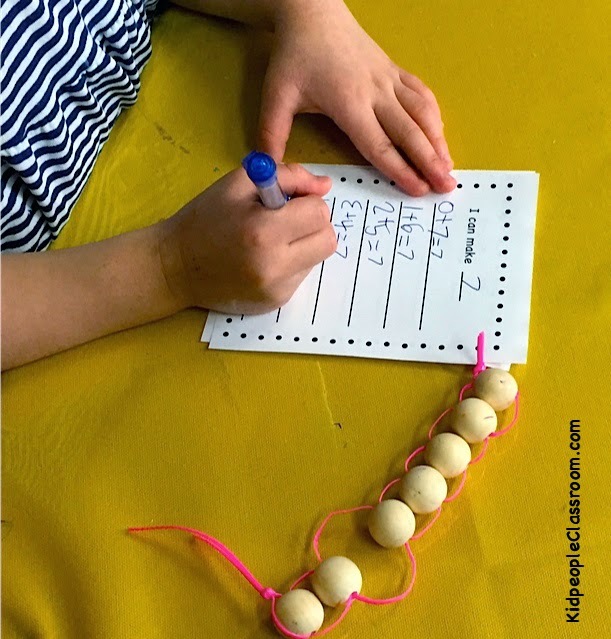 You can use these bead sliders for many math activities that you already have, but I put together two new sheets just for composing number families. 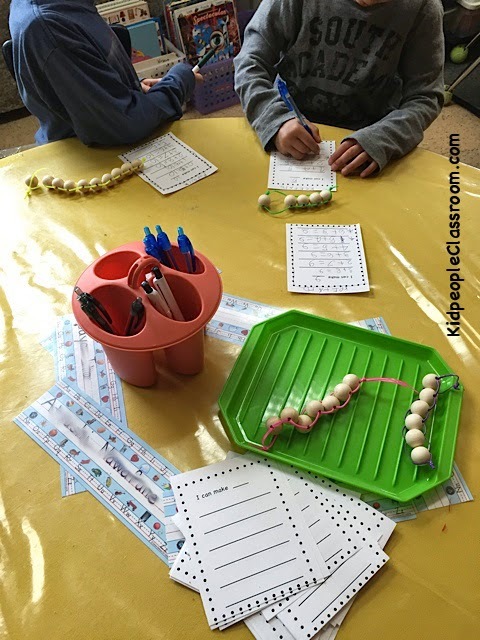 Kids choose a bead slider, write the number of beads on the top of the list, then write the number sentences that match the bead groups as they slide the beads over one at a time. You see the short list version in the photos, but I have a longer list if you want your students to find all the ways to decompose larger numbers. Both sheets are in the freebie. Click on the photo below to get it. You can find another type of bead stick in last week's post. This chenille stem style is easier to make, but doesn't have the same tactile input when kids move the beads. I use both kinds for variety. Click on the photo to see post. Hope your kiddos have fun while learning, and you do, too! If you liked these ideas and freebies, please PIN! Thanks. 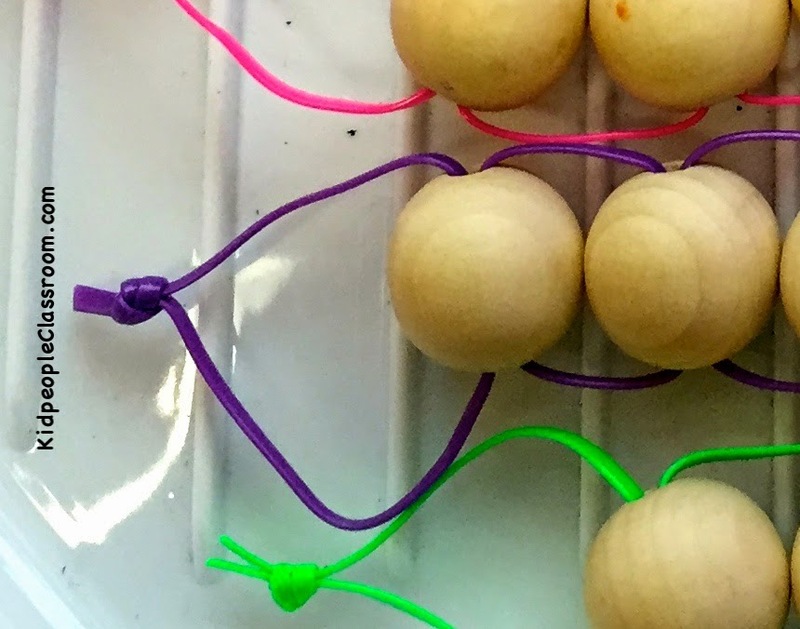 Head on back to find more great DIYs for the classroom and life by clicking below. Thanks Tara! Whew! Five posts in four days– how did that happen? And a freebie or two on almost every one. It's either feast or famine with me, I guess. If you've missed any of the last six posts it might be worth your while to cruise back and grab some easy activities. Thanks for stopping by! See you next time for Five for Friday. Labels: Math, Monday Made It! This is a great idea! I love the photos of their little hands working. Five for Fools with a Freebie, Too!